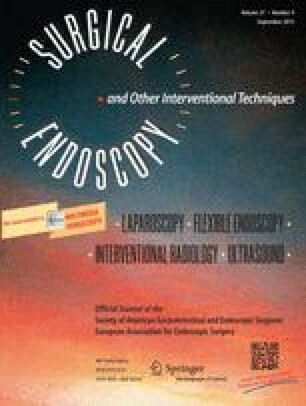 Laparoscopic colorectal resection improves patient outcome by reducing pain, postoperative pulmonary dysfunction, gastrointestinal paralysis, and fatigue. A multimodal rehabilitation program (“fast-track”) with epidural analgesia, early oral feeding, and enforced mobilization may further improve the excellent results of laparoscopic colorectal resection, enabling early ambulation of these patients. Fifty two consecutive patients underwent laparoscopic sigmoidectomy with standardized regular perioperative treatment (standard) or multimodal rehabilitation program (“fast-track”). Outcome measures included pulmonary function, duration of postoperative ileus, pain perception, fatigue, morbidity, and mortality. Twenty nine standard-care patients (19 men and 10 women) and 23 fast-track patients (15 men and eight women) were evaluated. Demographic and operative data were similar for the two groups. On the 1st postoperative day, pulmonary function was improved (p = 0.01) in fast-track patients. Oral feeding was achieved earlier (p < 0.01) and defecation occurred earlier (p < 0.01) in the fast-track group. Visual analogue scale scores for pain were similar for the two groups (p > 0.05), but fatigue was increased in the standard-care group on the 1st (p = 0.06) and 2nd (p < 0.05) postoperative days. Morbidity was not different for the two groups. Fast-track patients were discharged on day 4 (range, 3–6) and standard-care patients on day 7 (range, 4–14) (p < 0.001). Multimodal rehabiliation can improve further on the excellent results of laparoscopic sigmoidectomy and decrease the postoperative hospital stay. Note: Author W. Schwenk is a member of the German Advisory Board for Parecoxib/Valdecoxib of the Pfizer Company.